What is it going to be? Revolution or Resurrection? 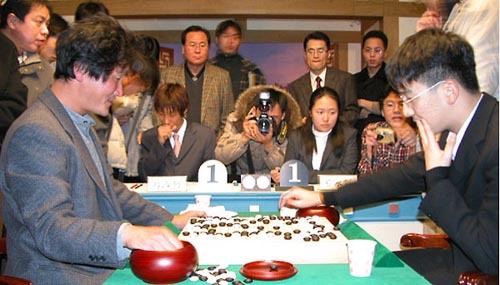 That was the question asked on www.cyberoro.com, one of the more popular Korean Baduk sites. Probably they meant (I cannot read the rest) that if the "Young Prince" Pak wins, it will be the final breakthrough of a new generation of Korean players. On the other hand, if Cho wins, it will be the come back of the champion of an older generation. There is an 8 hour time difference between Korea and the Netherlands. The match started at 01:00 am my time; too late to start watching it. weiqi.tom.com was supposed to have a life feed of the game. By the time I had finished my first meeting the following morning it was 11:00 am. The game was indeed there, and it had already finished. Cho had been white again and he played in the same style as game 2. 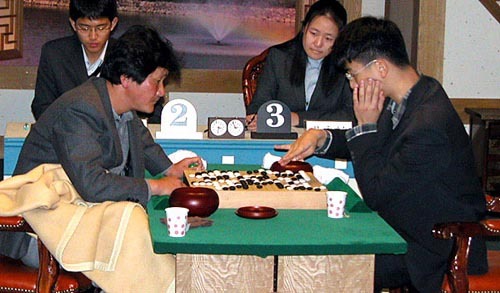 The opening started out with exactly the same fuseki as Pak had played against Xie He in the second game of the semi-finals. Cho was the first to divert from that game, but I think it gave him even more of a psychological advantage than he already had. In any case, around move 180 Pak blundered and Cho cut off a number of stones; when black resigned, white was already clearly ahead on the board. This is Cho's 66th title and only his second international one. His first one was the Fujitsu in 1991, but he won by default because his opponent was too ill too play. After that, he only once entered in the finals of an international cup before: that was in the 4th Tong yang Securities Cup. That final, best of 5, he lost 0-3 to Yi C'hang-ho. Some impressions from the first two games. Game 1: analysis immediately after the game of one of the many ko fights in this game. In the first game, Cho made an error in the early battle in the lower left. He fought ko after ko to get back, but Pak showed all his skills and stayed ahead. White won by 4.5 points. Game 2 -- white has won a very territorial game by resignation. Game 2: Yi Se-tol joins Pak Yeong-hun in the analysis. Q)  Congratulations. Any comment about the games? A)  It was a 100% lost game (the deciding game). outcome of the game. Was this the case? A)  Yes, it's true. It was a totally hopeless game... I got lucky. Looking back, it might have been destiny. Cup back in '91. So, this must be special for you. these past years. Why? Korean fans want to know. it was tough for me to do well in the international stage. Q)  You seem to be getting better at adapting to the three-hour limit. A)  Yes, somewhat. I'm trying. Q)  You have once said that you played with your life on the line. Now, it seems your attitude is becoming rather softer? A) Yes, I'm not like that any more. I couldn't afford to. A)  I certainly hope so. Q)  Your assessment of Park YoungHoon, 4p? went easy on me this time... He'll be an even better player. 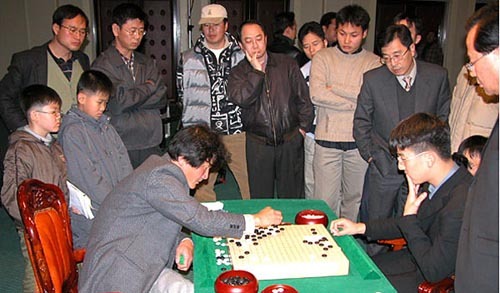 Q)  Your view on whether baduk could be considered a sport or an art? nowadays, as exemplified in world championships. Q)  How did you like the Young Nam Univerisity as the venue? A)  It's awesome. It is also close to Pusan, which is my hometown. Q)  Who gave you the most trouble? difficult. It was a turning point. Q)  Who would you pick as Lee Changho's successor? A)  Haha, it's Lee Sedol, of course. He's naturally strong. Q)  Your ambition for the future? A)  I'd like to win one more international championship.